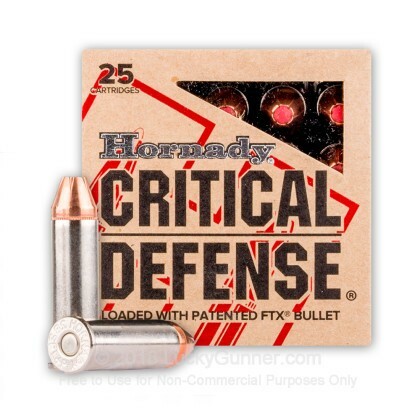 We wanted to know exactly what happens to a self-defense handgun bullet on impact, so following FBI protocols, we fired five rounds of Hornady 110 gr FTX Critical Defense +P from 10 feet, through four layers of cloth (to simulate clothing), into synthetic ballistic gelatin. The photos below show the bullets recovered from the gelatin after being fired from a Kimber K6s pistol. There’s also a high speed video that shows the bullet impacting the gelatin block. 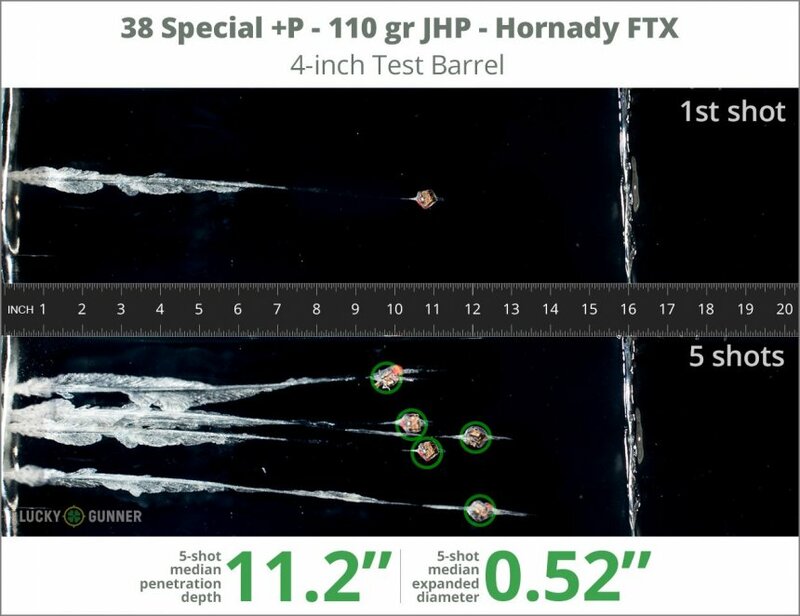 All the data we gathered pertaining to expansion and penetration of this load can be found in the chart below, and the diagrams at the bottom of the page show how it compares to other .38 Special self-defense loads from our tests. 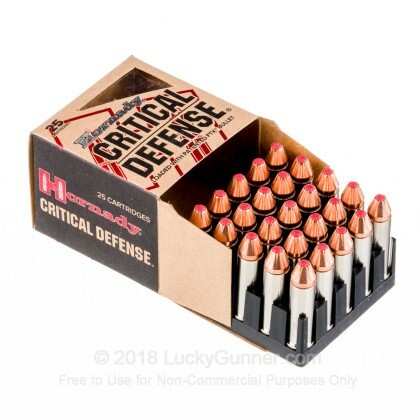 In addition to the .38 Special Hornady 110 gr FTX Critical Defense +P, we tested over 100 other self-defense loads, so check out Lucky Gunner Labs for the full story. 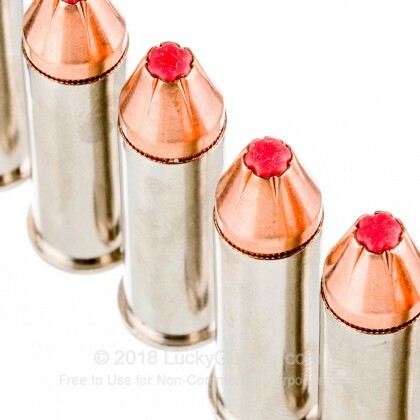 We wanted to know exactly what happens to a self-defense handgun bullet on impact, so following FBI protocols, we fired five rounds of Hornady 110 gr FTX Critical Defense +P from 10 feet, through four layers of cloth (to simulate clothing), into synthetic ballistic gelatin. The photos below show the bullets recovered from the gelatin after being fired from a Ruger GP100 pistol. There’s also a high speed video that shows the bullet impacting the gelatin block. If it does what it is advertised to do, then it is worth the expense. 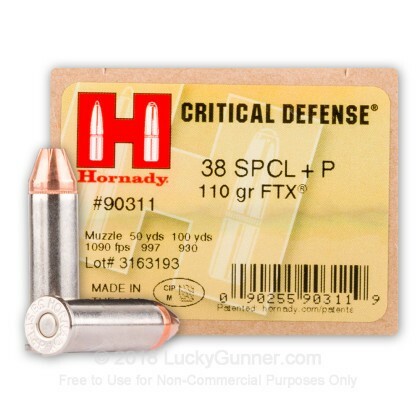 That aside, the ammo is clean, consistent in its reliability and accurate. 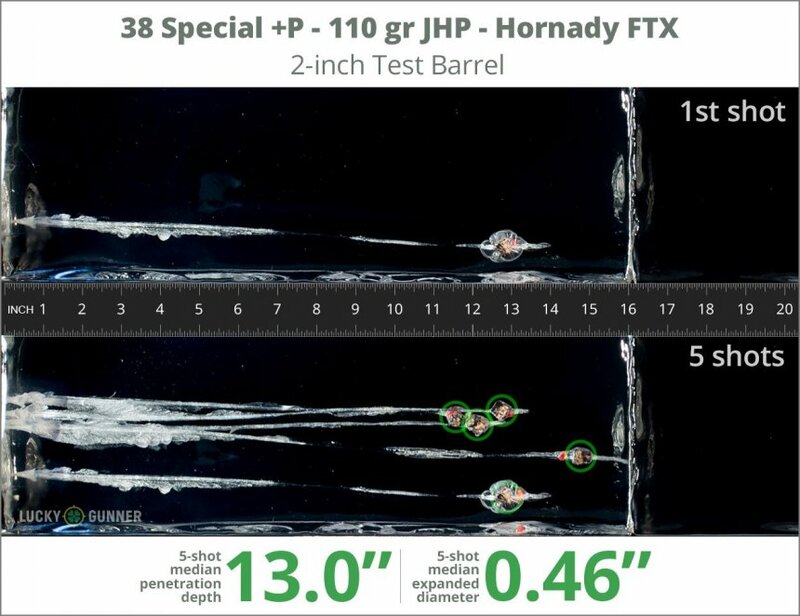 Q: What are the possible reasons why the .38 FTX Critical Defense actually performed better in your gel testing than the .38 +P FTX Critical Defense loads? I would have expected the opposite. Also, in some tests, the 2-inch barrel actually performed better than the 4-inch barrel. Those results are counterintuitive. Thanks for taking my two questions. A: Tony, there can be many reasons for these types of anomalies in testing results, and we may never be able to know the causes. +P rounds often do not penetrate as deeply as the standard rounds since, due to the higher velocity, the expansion begins earlier which will effect the depth of penetration in the same medium. 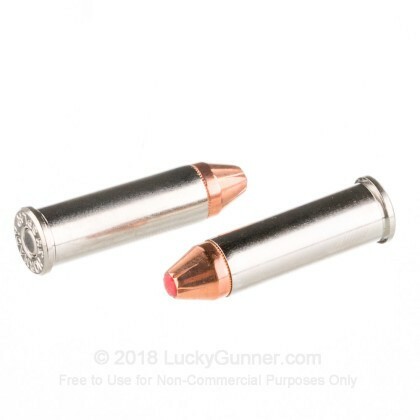 Many manufacturers take this in consideration, particularly in the weaker calibers and make the higher velocity bullet with a harder core to slow expansion and allow deeper penetration. All of which can seemingly "skew" the comparison and be confusing. 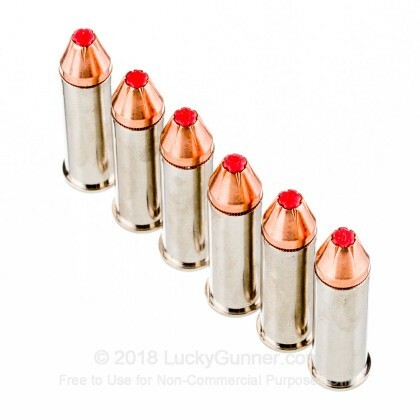 The thing to remember is that all bullets of one design may not have the same exact construction, but may be "tweaked" by the mfg so that the bullet performs very well. Because of this, I always advise a customer to enjoy the testing and comparisons, but focus on how well the round YOU choose performs by it's own standards.